Background/aims Hand hygiene is recognized globally as a leading measure to reduce healthcare-associated infection. However, compliance with hand hygiene is unacceptably low. Physicians − in particular − have repeatedly been observed to be poor compliers. Promotion of this important practice is a complex issue. It is important to study the behavioral determinants in relation to hand hygiene practices to develop effective improvement strategies. The aims of our study are to assess the knowledge of the physician and their attitudes and practices of hand hygiene, to identify the behavioral determinants of noncompliance, and to recommend interventions that could increase the practice. Participants and methods An anonymous questionnaire was administered that included four sections: participants’ demographic data, self-reported compliance on the basis of the Centers for Disease Control and Prevention Guidelines, attitudes in relation to the studied behavior adapted from a validated published questionnaire, and the knowledge assessment section chosen from the WHO questionnaire. The questionnaire was distributed by infection control practitioners at King Saud Medical City − a tertiary care hospital in Riyadh, Saudi Arabia − and self-completed by 127 physicians of different specialties during March–May 2015. Results The response rate was 75%. The mean self-reported compliance rate was 89.4%. A multiple linear regression analysis was carried out on the studied variables that identified three main predictors most likely to be correlated with hand hygiene behavior noncompliance: self-efficacy (β=0.252; P=0.004), time-related attitude (β=0.16), and usefulness-related attitude (β=0.148). Conclusion Understanding the determinants of a fundamental behavior such as hand hygiene in healthcare settings is among the essential steps to plan more effectual intervention strategies for compliance improvement. Contributions from behavioral and social sciences are crucial when designing studies to investigate and improve behavior acquiescence. The healthcare system is complex and more studies are needed to elaborate specific behavioral determinants in relation to the practice of hand hygiene in other variable work situations and among different healthcare workers categories and employee belong to different culture group. Healthcare-associated infections (HCAIs) are a major concern for quality and patient safety in healthcare institutions worldwide as they may lead to permanent disability, increased burden of antimicrobial resistance microorganisms, and unnecessary use of financial resources . HCAIs continue to represent a major risk to individuals’ health, being a significant risk factor for serious undesirable consequences such as increased morbidity, extended hospitalization, and a higher mortality rate . Improper practice of hand hygiene by healthcare workers (HCWs) is responsible for almost half of the HCAIs . Adherence to the recommended hand hygiene guidelines is considered to be the most powerful protective mechanism against acquisition and transmission of pathogenic microbes ,. Despite being a nondoubtful preventive measure, hand hygiene is still a neglected practice, with poor overall compliance among HCWs . On the basis of the commonly published data, healthcare practitioners were noted in the literatures to have an overall compliance rate of 40% in terms of adherence to hand hygiene practices. This reported figure was based on the findings of more than 30 studies over 20 years starting in 1980 in which the compliance rate ranged from 5 to 81% . Although numerous improvement initiatives have been studied and cited in the early part of the 21st century, no comprehensive review has reported an improvement in this 40% compliance rate. The expectations of the practitioner performance have definitely increased, and at one point, The Joint Commission, the body that accredits healthcare organizations in the USA, expected hospitals to achieve greater than 90% hand hygiene compliance . The wording of this standard has since been changed to the following: ‘Set goals for improving hand cleaning. Use the goals to improve hand cleaning.’ . Several programs have been developed to increase practices of hand hygiene in healthcare facilities, but only a few of them have led to long-lasting changes in compliance. Adherence to the guidelines remains unacceptable and below the required standards in many facilities . Changing healthcare staff practices is a particularly challenging task, and it is often expected that education on a topic will lead to improved knowledge and practices. However, this assumption is inaccurate, with many studies proving that although knowledge can be achieved through provision of training, there is no guarantee that will result in sustained change in behavior . The clinical practices of healthcare staff are an outcome of a complex combination of skills, knowledge, and attitudes. Numerous psychosocial parameters affecting hand hygiene behavior include perception towards role model, social norms, behavior control, and risk of infection. Other influencing variables include hand hygiene practices, attitude toward that behavior, intention, and motivation ,. According to Allegranzi et al. , establishment of patterns of hand cleansing mostly occurs before 10 years of age. This early habit can have effects on attitudes toward hand cleansing for the rest of an individual’s life. Experience of hand hygiene behavior is based on what is learned at home, school or temple, and the outcomes associated with hospital-associated infections are consistent with imitating and repeating the gained behavior . Most studies that have assessed healthcare practitioners’ knowledge and practices of hand hygiene have concluded that, despite adequate theoretical knowledge, compliance is still inadequate. This indicates the significance of assessing factors fundamental to hand hygiene that may impact its advancement among this targeted career . Behavioral and social contexts affecting hand hygiene practices have been the focus of many recent studies. Yet, there is still an urgent need to gain more knowledge . Despite the complexity of the various dynamics of changing behavior, they should be considered when designing programs aiming to promote hand hygiene practices . Squires et al. reported that being a physician is an obstacle against practicing hand hygiene . Targeting physicians in this study to determine the behavioral determinants of hand hygiene was based on their low compliance in comparison with other HCW categories. Different campaigns and activities have been conducted in the study institution; yet, the targeted compliance rate of hand hygiene has not been achieved. It is expected that the outcomes of this study will help to understand the underlying factors affecting hand hygiene behavior and to design effective interventions, especially when considering this study setting which is a complex healthcare facility providing wide range of services and recruiting multinational staff with variant cultural background. Study type: This was a descriptive cross sectional knowledge, attitudes, and practice assessment study with further data analysis to describe possible determinants of hand hygiene behavior. Setting, duration, and population: the study was carried out at a 1400-bed capacity facility of the Ministry of Health in Riyadh Saudi Arabia, King Saud Medical City. It is a tertiary care educational hospital and referral center. Data were collected during March–May 2015. The study sample included all physicians of different grades working in four main specialties in the facility one who were available during the study duration and provided their verbal consent for participation. A total of 170 questionnaires were distributed; of these, 127 were returned with complete data. Participant demographic data (seven constructed items). A self-reported compliance scale (12 items, based on the guidelines from the Centers for Disease Control and Prevention). Questions on attitudes toward hand hygiene (25 items) adapted from a validated questionnaire (De Wandel et al., 2010) and reviewed by a consultant psychiatrist. Knowledge of hand hygiene (12 items) selected from a validated WHO questionnaire on hand hygiene. Statistical analyses were carried out using SPSS version 21 (SPSS Inc., Chicago, Illinois, USA). All compliance questionnaire items (1–12) were included as they all had means less than 96% and provided an overall compliance score. To normalize the compliance scores, they were subjected to an angular transformation for use in further analyses. Principal components analysis with orthogonal rotation was carried out. The internal reliability of the resulting factors and questionnaire items was checked using Cronbach’s α. Correlations were performed between different questionnaire items. Stepwise multiple regressions were performed with the compliance score as the dependent variable and other variables, including three factors from the principal components analysis, as predictors. The study was carried out according to institutional research ethics guidelines. Out of 170 questionnaires distributed, 127 were completed and collected, yielding a response rate of 75%. This study sample represented a subpopulation of all physicians working at King Saud Medical City. Participants’ age ranged between 27 and 67 years (mean age: 40.8; SD: 10.3). Most of the participants were men and the majority worked in medical wards. Around one-third of the study population included senior professionals with a PhD or equivalent degree and 10–20 years of experience. A total of 60% of the study population were non-nationals and of these, 80% were from Arab countries other than Saudi Arabia and only 20% were from non-Arab countries ([Table 1]). The mean self-reported compliance (12 questions) was 89.4% (SD: 12.3%). The rates ranged from 76.6% (SD: 20.6%) for ‘Before patient skin contact’ to 96.0% (SD: 14.1%) for ‘Indwelling urinary catheterization’. Following the procedure used by the De Wandel et al. questionnaire, 25 variables of attitude assessment were grouped into identifiable factors presented in [Table 2]. The overall score of attitude toward hand hygiene was 4.34. This score was calculated using a five-grade scale ranging from 1 to 5 for positive items and from 5 to 1 for negative items. [Table 2] shows the scores for the different subscales. The overall score of the six social influence variables was 3.42 and the collective score of the 10 self-efficacy variables was 3.8. Examination of correlations of attitude variables and self-reported compliance produced four significantly correlated variables ([Table 3]). A multiple linear regression analysis was carried out on these and other variables ([Table 4]), which identified three main possible predictors of noncompliance with hand hygiene behavior including self-efficacy (β=0.252; P=0.004), time-related attitude (β=0.16), and usefulness-related attitude (β=0.148). Aligned with the WHO Multimodal Hand Hygiene Improvement Program, strategies targeting the determinants of hand hygiene behavior that were obtained from this study are recommended ([Table 5]). Compared with direct observation data collected by trained staff from the infection control department in the settings of this study, the physicians’ self-reported compliance measurement was around overestimated 100% (double score vs. the observed measures). Several studies recognized the poor validity of self-reported compliance as an assessment tool for hand hygiene practices . Participants tended to overscore positive health-promoting behavior, which is socially acceptable, up to three times the observed compliance rates . Additionally, They used to have unlikely estimation of their own conduct . The overall score of participants’ attitude was almost satisfactory; however, some attitude-related variables were found to be low adherence predictors. Time-related attitude was found to be among the predictors that negatively affected hand hygiene behavior. The response of our study participants to the five questions on time-related attitudes reflected their perception that hand hygiene practice is time consuming and impractical with the work overload. Similarly, in his article about update on hand hygiene Bolon  reported that the time required for hand hygiene measures is a frequently reported barrier to acceptable adherence. Introduction of time-saving measures such as alcohol-based hand rubs was intended to increase staff compliance. Despite using an alcohol-based hand rub, it was estimated that 230 min per patient per day would need to be devoted to hand hygiene in an ICU as there are countless hand hygiene opportunities occur throughout the day . The considerable demands on their time, low prioritization, insufficient time, and inconvenience of hand wash equipment placement have been reported by healthcare employees in many researches as factors that contribute toward ineffective hand hygiene compliance . A contradicting finding was reported by De Wandel et al. ; their study found that increased work pressure in the ICU did not directly affect hand hygiene practices despite of more frequent occasions that indicate hand cleaning and the stressful nature of ICU duties than other settings . The second reported significantly correlated predictor for our study focus behavior was the usefulness-related attitude. This finding can be attributed to the lower observed compliance among physicians at this study institution compared with other HCWs. As on many occasions in this study setting, physicians always negotiate the role of properly cleaned hand as a solo factor in preventing HCAIs and risk factors other than poor compliance with hand cleanliness are always raised. Considering numerous studies that showed the influence of positively changing hand hygiene routine in reducing HCAIs, effective practice of such a preventive behavior is unquestionably the main tool for preventing infection transmission . Johnson et al. reported a 10-fold reduction in central line-associated blood stream infections (4.02 vs. 0.42 per 1000 device-days) when hand hygiene improved from 58 to 98% along with implementation of a central line bundle. In addition, successes were achieved in pediatric populations; Song et al. reported that a reduction in the rate of methicillin-resistant Staphylococcus aureus infections occurred by almost 50% when compliance with hand hygiene practices improved from 50.3 to 84%. In contrast, a 3-year study carried out in Ontario did not show that promotion of hand hygiene compliance was associated with any change in methicillin-resistant S. aureus bacteremia or Clostridium difficile infection rate. The possible limitation that could underestimate the level of evidence of the effectiveness of hand hygiene is that most of the improvement studies lacked a control group; also, multifactorial underlying risks for HCAIs were also present . On the basis of our finding, training using visual tools that show the effectiveness of using hand sanitizers on the spot, in conjunction with providing feedback about its positive outcomes including reduction of HCAIs and improved patient safety parameters, can help to increase physician commitment with the recommended practices. However, with their extensive experience in conducting awareness campaigns on hand hygiene at the University of Geneva hospitals, Sax et al. reported that the staff strongly favored hand hygiene practices, but high self-efficacy perception and peer pressure play a greater role in modeling their adherence rather than the logic rationale of hand hygiene impact on protecting patients from harm. Thus, behavioral modeling along with improved awareness and feedback is crucial. The third reported significantly correlated predictor for hand hygiene behavior was self-efficacy, which is defined as the judgment of individuals of their capabilities to perform certain behavior (reflected in questions 16–25 in the questionnaire attitude section). De Wandel et al. reported that nurses with poor self-efficacy are less compliant and pointed to the strength of self-efficacy as a behavior predictor. Pittet and Boyce  reported that it is a resilient self-efficacy sense that allows one to move forward or its poor sense that impedes accomplishments. Self-efficacy has become a basic and necessary component of different behavioral theories and is listed among the most important elements correlated with changing behavior. Peterson and Bredow  have utilized the theory of self-efficacy to guide interventions and predict nursing behavior by focusing on clinical aspects of care, education, nursing competency, and professionalism, and according to their experience, with the use of skills, information, and other self-influence tools to guide behavior performance, individuals can make their own decision on how to behave.Improvement of individuals’ self-efficacy through indirect experience and verbal persuasion were found to be applied and effective in enhancing the practice of hand hygiene in healthcare settings. Higher compliance by practitioners and staff working in the healthcare field has been observed when role models follow hand hygiene and when introducing the religious concepts as convincing evidence in project that target health promotion . These findings were confirmed by the study of Snow et al. , who found that a certified nurse aide mentor’s performance in relation to hand hygiene was the strongest predictor of hand hygiene rates of students. Also, Lankford et al. reported that medical staff were significantly less likely to practice hand hygiene if an associate or a higher-positioning individual in the room did not. In spite of that these notices recommend that hand-cleanliness practices can be influenced by good example or companion consistence, learned practices or time limitations may contrarily impact team sustainable adherence to hand-cleanliness guidelines. Another strategy for enhancing self-efficacy and improving performance is physiological feedback. The link between improvement in hand hygiene and physiological feedback was reported in a study by Nicol et al. ,. The study showed that clear direct involvement, for instance, an individual experienced an outbreak in his institution or reported exposure of the patients under his care to adverse events due to infection found to have the strongest impact on hand hygiene behavior. The enthusiastic impression of this vivid experience makes more forceful and persistent effect on their orientation level and prompts maintained change toward better practice of hand hygiene. We did not find significance value of either social influence or guidelines awareness as hand hygiene predictive. This finding is in agreement with the findings of David, whose questionnaire was adapted in our study. Hand hygiene is a human health-related behavior that is a consequence of multiple influences. Understanding the determinants of this behavior in the healthcare setting is among the first steps of planning more effectual intervention strategies for changing behavior. Contributions from behavioral and social sciences are essential when designing studies to investigate and achieve improvements in the compliance rate. The self-efficacy theory can be utilized as a model to improve the desired outcomes related to hand hygiene and to guide its conduct. Incorporating diverse initiatives toward behavioral change appears to be the best strategy. Considering the determinants identified, creative techniques should be used aligned with the WHO multimodal program. The authors would like to extend their sincere appreciation to the staff of Prevention and Control of Infection Administration at King Saud Medical City for supporting the data collection of this study survey. Calfee DP. Crisis in hospital-acquired, healthcare-associated infections. Annu Rev Med 2012; 63:359–371. Mahfouza AA, El Gamalb MN, Al-Azraqic TA. Hand hygiene non-compliance among intensive care unit health care workers in Aseer Central Hospital, south-western Saudi Arab. Int J Infect Dis 2013; 17:e729–e732. Larson E. A tool to assess barriers to adherence to hand hygiene guideline. Am J Infect Control 2004; 32:48–51. Erasmus V, Daha TJ, Brug H, Richardus JH, Behrendt MD, Vos MC et al. Systematic review of studies on compliance with hand hygiene guidelines in hospital care. Infect Control Hosp Epidemiol 2010; 31:283–294. Cipolla D, Giuffrè M, Mammina C, Corsello G. Prevention of nosocomial infections and surveillance of emerging resistances in NICU. J Matern Fetal Neonatal Med 2011; 24(Suppl 1):23–26. Brog MA, Benbachir M, Cookson BD, Ben Redieb S, Elnasser Z, Rassian O et al. Health care worker perceptions of hand hygiene practices and obstacles in a developing region. Am J Infect Control 2009; 37:855–858. Guideline for Hand Hygiene in Health-Care Settings. Recommendations of the Healthcare Infection Control Practices Advisory Committee and the HICPAC/SHEA/APIC/IDSA Hand Hygiene Task Force. Society for Healthcare Epidemiology of America/Association for Professionals in Infection Control/Infectious Diseases Society of America. MMWR Recomm Rep 2002; 51 (RR-16):1–45. [quiz: CE41–44]. Boyce JM. Update on hand hygiene. Am J Infect Control 2013; 41(5 Suppl):S94–S96. Hospital National Patient Safety Goals. 2015. Available at: http://www.jointcommission.org/assets/1/6/2015_hap_nspg_er.pdf. [Accessed 13 January 2016]. Lohiniva A, Bassim H, Hafez S, Kamel E, Ahmed E, Saeed T, Talaat M. Determinants of hand hygiene compliance in Egypt: building blocks for a communication strategy. Eastern Mediterranean health J 2015; 21:665–670. Cooper T. Putting educational theory into clinical practice. J Hosp Infect 2007; 65:124–127. Whitby M, Pessoa-Silva C, McLaws ML, Allegranzi B, Sax H, Larson E et al. Behavioural considerations for hand hygiene practices: the basic building blocks. J Hosp Infect 2007; 65:1–8. Pittet D, Simon A, Hugonnet S, Pessoa-Silva CL, Sauvan V, Perneger TV. Hand hygiene among physicians: performance, beliefs, and perceptions. Ann Intern Med 2004; 141:1–9. Allegranzi B, Memish Z, Pittet D. Role of hand hygiene in healthcare-associated infection prevention. J Hosp Infect 2009; 73:305–315. De Wandel D, Maes L, Labeau S, Vereecken C, Blot S. Behavioral determinants of hand hygiene compliance intensive care units. Am J Crit Care 2010; 19:230–239. Squires JE, Suh KN, Linklater S, Bruce N, Gartke K, Graham ID et al. Improving physician hand hygiene compliance using behavioural theories: a study protocol. Implement Sci 2013; 8:16. Haas JP, Larson EL. Measurement of compliance with hand hygiene. J Hosp Infect 2007; 66:6–14. Ronk LL, Girard NJ. 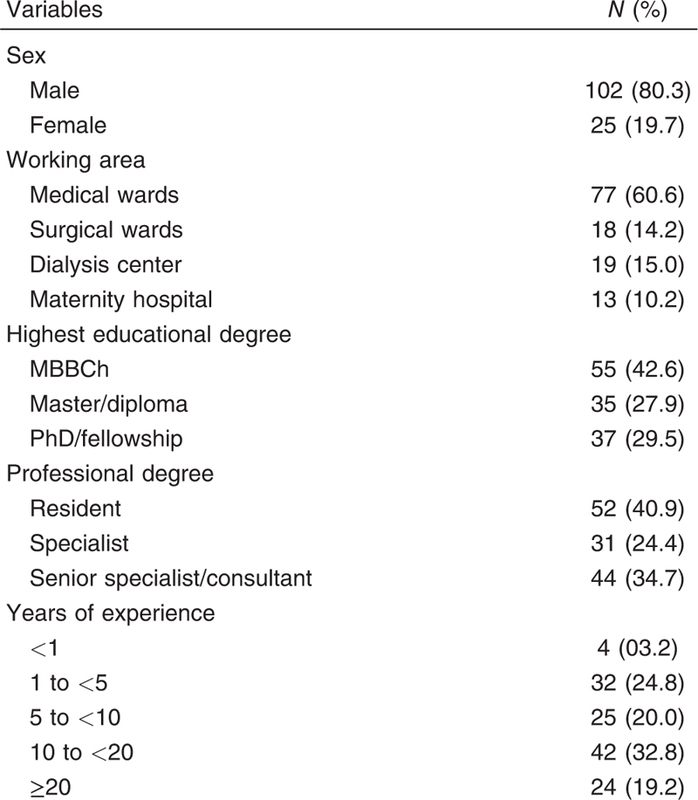 Risk perception, universal precautionscompliance: a descriptive study of nurses who circulate. AORN J 1994; 59:253–266. Broughall JM, Marshman C, Jackson B, Bird P. An automaticmonitoring system for measuring handwashing frequency in hospital wards. J Hosp Infect 1984; 5:447–453. Bolon MK. Hand hygiene: an update. Infect Dis Clin North Am 2016; 30:591–607. McArdle FI, Lee RJ, Gibb AP, Walsh TS. How much time is needed for hand hygiene in intensive care? A prospective trained observer study of rates of contact between healthcare workers and intensive care patients. J Hosp Infect 2006; 62:304–310. Boyce JM. It is time for action: improving hand hygiene in hospitals. Ann Intern Med 1999; 130:153–155. Mortell M, Balkhy HH, Tannous EB, Jong MT. Physician ‘defiance’ towards hand hygiene compliance: Is there a theory-practice–ethics gap?. J Saudi Heart Assoc 2013; 25:203–208. Johnson L, Grueber S, Schlotzhauer C, Phillips E, Bullock P, Basnett J, Hahn-Cover K. A multifactorial action plan improves hand hygiene adherence and significantly reduces central line-associated bloodstream infections. Am J Infect Control 2014; 42:1146–1151. Sax H, Uçkay I, Richet H, Allegranzi B, Pittet D. Determinants of good adherence to hand hygiene among healthcare workers who have extensive exposure to hand hygiene campaigns. Infect Control Hosp Epidemiol 2007; 28:11. Pittet D, Boyce JM. Hand hygiene and patient care: pursuing the Semmelweis legacy. Lancet Infect Dis 2001; 1:9–20. Peterson SJ, Bredow TS. Middle range theories application to nursing research. 3rd ed. Philadelphia, PA: Wolters Kluwer Health; 2013. Snow M, White GL Jr, Alder SC, Stanford JB. Mentor’s hand hygiene practices influence student’s hand hygiene rates. Am J Infect Control 2006; 34:18–24. Lankford MG, Zembower TR, Trick WE, Hacek DM, Noskin GA, Peterson LR. Influence of role models and hospital design on hand hygiene of healthcare workers. Emerg Infect Dis 2003; 9:217–223. Nicol PW, Watkins RE, Donovan RJ, Wynaden D, Cadwallader H. The power of vivid experience in hand hygiene compliance. J Hosp Infect 2009; 72:36e42. Song X, Stockwell DC, Floyd T, Short BL, Singh N. Improvement hand hygiene compliance in health care workers: Strategies and impact on patient outcomes. Am J Infect Control 2013; 41.